Cologne is the four most populated cities in Germany. These days the city is a beautiful cultured destination with great leisure facilities, pubs and shops. However, during WWII, Cologne was heavily bombed and damaged. After years of restoration work it has been rebuilt to portray the wonderful historic Roman city it use to be. Travelling to Cologne - Flying is the recommended choice of transport as the city has Köln/Bonn Konrad Adenauer Airport located 10km from the centre. Also, for people arriving from countries that are outside Europe, Frankfurt Airport is the closest and provides transfers for the 200km journey. Trains and large roads make it easy to get to the city via other methods. The Best Western Premier Hotel Regent is an ultra-modern building with a red façade located in a quiet residential area, three kilometres from Cologne's city centre. Mediterranean cuisine and an array of wines are served in the Mediterranean-style restaurant with its modern design furnishings. The Lounge Bar offers light Mediterranean snacks and drinks and a relaxed, contemporary setting. After a tiring day of business or sightseeing, guests can revitalize body and mind in the sauna, solarium, steam room and fully equipped fitness centre. Conferences and banquets can be held in the hotel's function rooms. The 24-hour front desk offers a safe-deposit box, concierge services, dry cleaning and laundry services. Those with laptops can check emails via wireless Internet. Cologne's city centre, three kilometres away, has rich culture offerings with the Museum of Far Eastern Art, the Kathe- Kollwitz Museum of Art and the Metropolitan Historical Museum. 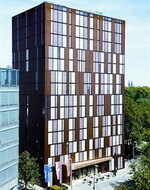 The Central Hotel am Dom is a modern hotel set in the centre of Cologne, 150 metres from the historical old city and the twin spires of the cathedral. With simple, modern decor and furnishings, guestrooms include satellite TV, clock radios, direct-dial phones, hair dryers, safes, Internet ports, and minibars. After a day sightseeing, guests can enjoy international and local specialties or Chinese cuisine in the hotels two restaurants, relax with a drink in the Art Deco bar or order a light meal from the room service menu. Those guests wishing to surf the web or catch up with emails can take advantage of the hotel's high-speed wireless internet access.The front desk has a safe-deposit box for the storage of valuables. Parking facilities are 150 metres from the hotel. It is 100 metres from the hotel to Cologne's shopping area and financial district, and 150 metres to the main railway station. The Dom Hotel, Cologne, set right in the centre of town, overlooking the Gothic cathedral, is a contemporary residence housed in a refurbished historic building. The 124 guestrooms feature contemporary decor in bright, warm colours, and are equipped with flat-screen plasma televisions with cable channels, high-speed and wireless Internet connections, minibars, desks and safes. Black Italian marble-clad bathrooms include shower/tub combinations and complimentary toiletries. Le Mérou is a contemporary restaurant with burnt ochre, bright red and light-wood decor, offering seafood dishes and views of the cathedral. After dinner, guests can head to the Sir Peter Ustinov Bar, a modern lounge decorated with photographs of the famous actor, serving traditional and house-speciality cocktails. The Dom Hotel, Cologne serves ice creams on the Lido Terrace in summer where guests can relax and which offers panoramic views over the cathedral. 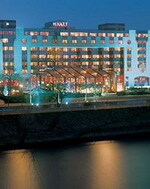 The Hyatt Regency Cologne is an imposing modern building with a grandiose glass entrance portico and views over the River Rhine, cathedral and Cologne's historic centre. This six-storey hotel features 306 air-conditioned guestrooms with 36 square metres of space, decorated in warm, natural colours and with contemporary design furnishings. Rooms offer either views of the inner courtyard or the Rhine. All rooms have an interactive television system with pay movies and Internet access. Marble bathrooms feature separate showers and bathtubs. Complimentary fresh fruit and bottles of water are provided. The Glashaus Restaurant offers contemporary Mediterranean cuisine, particularly Italian, served in an intimate chandelier-lit ambience with piano music, modern furnishings and bay windows overlooking the gardens, river and cathedral. Situated on the banks of the Rhine, the Hyatt Beergarden specialises in regional dishes and beers. 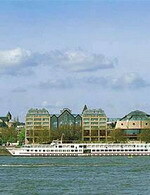 The Maritim Hotel Koeln in Cologne, Germany sits on the banks of the Rhine River and is one kilometer from the old city of Cologne. The hotel is linked to the Congress Centre. 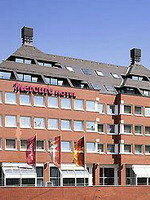 The Maritim Hotel Koeln features boutiques and restaurants in the lobby of the hotel. The exterior design of the building is reminiscent of a Parisian house. The hotel offers complimentary newspapers in the lobby. The multilingual staff at the hotel's 24-hour front desk provides currency exchange services and safe deposit boxes. A glass-roofed atrium highlights the Bellevue Restaurant, open for lunches, afternoon teas and dinners. Kolsche Stuff restaurant offers German cuisine. La Galerie Bistro is open for dinners on Tuesday through Saturday and serves Mediterranean-style meals. The Rostisserie is open for breakfasts and lunches. The hotel features an indoor swimming pool and health spa. 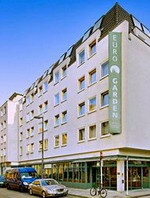 The Mark Hotel Euro Garden Köln City is a modern hotel located in a quiet side street 500 metres from the old centre of Cologne and 200 metres from the Rhine. There is high-speed wireless Internet access in the common areas, complimentary newspapers in the lobby, and a hotel bar. There is a business centre and rooms are available for meetings, while drivers have access to onsite garage parking. As well as offering a dry cleaning service and currency exchange, the 24-hour front desk can help guests with information on local attractions. 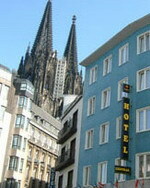 Cologne Cathedral is 500 metres from the hotel and the city's Zoo is one kilometre away. 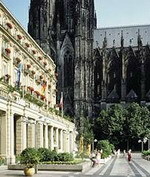 Cologne's main railway station is across the street from the hotel and Cologne-Bonn Konrad Airport is 17 kilometres away, an approximate driving time of 15 minutes. The Mercure Severinshof Koln hotel is a four-storey property set in the centre of Cologne, 50 metres from the S-Bahn station and within 1.5 kilometres of the city's shops, the historic old town and the museum district. The 253 air-conditioned guestrooms feature light decor and modern furnishings. Amenities include complimentary wireless Internet connections, cable television, direct-dial phone, clock radios, minibars, complimentary newspapers and bathrooms with shower/tub combinations. Active guests can work out in the fitness centre and afterwards unwind in the sauna or top up their tans in the solarium. The hotel also offers wellness massages for a fee. The colourful, modern restaurant serves regional and international dishes and overlooks the terrace, and the bright, modern bar serves drinks until late. Those with laptops can plan sightseeing itineraries via complimentary wireless Internet access, and newspapers are available free of charge in the lobby. 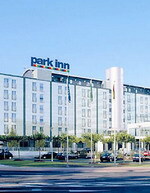 Park Inn Cologne City-West is a modern hotel in Cologne's business district, three kilometres from the historic downtown area and twin-towered cathedral. Guests can work out on the latest equipment in the sixth- floor Wellness Centre, with panoramic views of Lake Aachen and the city, then relax in the sauna, solarium and infra-red cabin. There is Wi-fi is for guests with laptops and conference rooms and business services. The hotel's dining option is the Triforum restaurant serving Mediterranean and local dishes, guests can dine outside on the terrace in the summer. After dinner guests can enjoy cocktails in the sophisticated Inn Takt Bistro and Bar. Cologne is full of places to see and nearby attractions include the historical monuments of downtown Cologne three kilometres away and the Imhoff-Stollwerck Chocolate Museum four kilometres away. 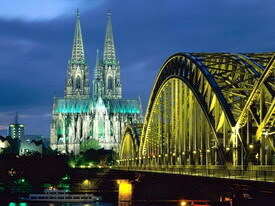 Cologne-Bonn Konrad Airport is 17 kilometres from the hotel, a 20- minute drive.